Put a scare in your September—stop by the New England Horror Writers’ booth at the Hebron Harvest Fair Thursday, September 8-Sunday, September 11. I’ll be there with horror writers including Danny Evarts, Dan Foley, Scott Goudsward (Shadows Over New England), Dan Keohane (Solomon’s Grave), Stacey Longo, TJ May (Ill Conceived), Kurt Newton (Black Butterflies), and Jennifer Yarter-Polmatier (The Coven: The Tale of the Vampire Nigel)—at last count; I’m sure there will be more. We’ll be selling books, T-shirts, and more at the table, and there will also be a special raffle featuring signed books by authors like Stephen King, so don’t miss it! Thursday, September 8: 4 p.m. to 10 p.m.
Friday, September 9: Noon to 11 p.m.
Saturday, September 10: 9 a.m. to 11 p.m.
Sunday, September 11: 9 a.m. to 8 p.m.
I’ll be there at various times beginning 9 p.m. on Friday through 11 a.m. or so on Sunday, so if you’re up that way, come see me! The Hebron Harvest Fair will be held at the Hebron Lions Fairgrounds, Route 85, 347 Gilead Street, Hebron, Connecticut. For more information, directions, admission prices and much, much more, visit their official website: http://www.hebronharvestfair.org. 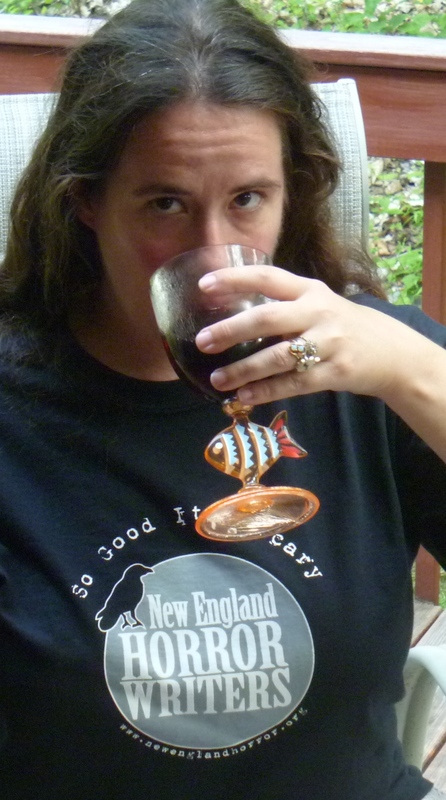 Me in the New England Horror Writers’ new T-shirts. I’m not sure if they’ll be sold at Hebron, but they will definitely be available at Rock & Shock in October and AnthoCon in November. 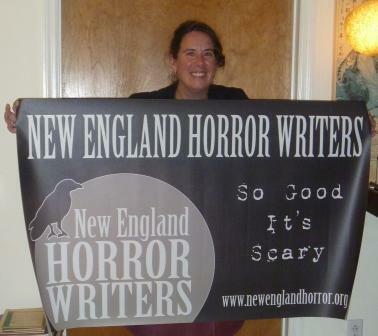 Me with the New England Horror Writers’ new Booth Banner for events. It was designed by Danny Evarts; I just handled ordering it. Its arrival was totally exciting! Posted on September 5, 2011, in News, Skeletons in the Swimmin' Hole -- Tales from Haunted Disney World and tagged Dan Foley, Dan Keohane, Danny Evarts, Hebron Harvest Fair, Jennifer Yarter-Pomatier, Jurt Newton, New England Horror Writers, Scott Goudsward, Shroud Magazine, TJ May. Bookmark the permalink. Leave a comment.